He had a 2.87 ERA last year in 32 starts. He had a 5.41 SO/BB ratio last year. He strikes out 8.1 batters per nine innings in his career. He has a career 3.48 SO/BB ratio. He gave up just 0.8 HR’s per nine innings last year. He has 200+ strikeouts in his last three seasons. Melky has never hit over .280 or had an OBP over .360 in five career seasons. Melky only hits an average of 10 homers per year. The Yankees needed a starter more than anything else. He could have said no to this trade, so you know he wants to pitch in New York. Melky is a good outfielder. The Yankees now need an outfielder, unless they trust Gardner everyday. Vazquez had a 4.91 ERA in his one year with the Yankees. Vazquez will cost more than Melky over the next couple of years. Smart. To me, the question with any trade is: Is you team better equipped to win? The answer here is yes. The Yankees really needed a starter. Vazquez is a verteran who has proved that he can be dominating. Yes he has had medioker years, but as a number three or four starter, that would be okay. As for Melky, he never really made a difference. The only reason people don’t like this deal is because they think Melky has great potential. Well, he hasn’t shown that in five seasons. You can’t fall in love with these guys who you are wating to see production from. In the end, the Yankees are now a stronger team. UPDATE 6:14 p.m. Just remember that this deal is taken out of context. 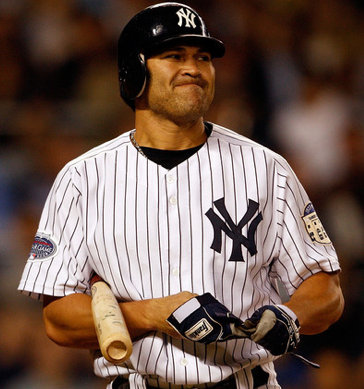 The Yankees are now players for an outfielder such as Jermaine Dye (Jon Heyman) and still Johnny Damon (Yankees.com). Better off talking about this trade in a month. UPDATE 6:59 p.m. You can add Mark DeRosa to that list of possibilities (WFAN.com). UPDATE 7:03 p.m. Also remember that the Yankees are unlikely to make a big deal for a Matt Holliday or Jason Bay, considering what the free agent market plays out for next year. Maybe Carl Crawford is a possibility?